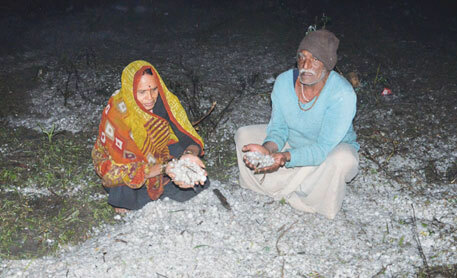 As many as 560 farmers have committed suicide following the hailstorms that battered Maharashtra in February and March this year, relief and rehabilitation minister Patangrao Kadam informed the Maharashtra State Assembly which is in session now. Out of them, 232 farmers have already been provided relief by government; 148 cases are pending and relief was rejected in 180 cases by officials on ground of ineligibility, he said. Kadam was responding to a discussion on the damage inflicted by the hailstorms and delay in reaching relief to affected farmers. He said that examination revealed that the 180 cases were rejected by administration on the premise that these farmers had not availed of a loan. However, orders have been issued to ignore the loan clause and provide relief to the affected families in view of the losses suffered due to the hailstorms. Orders have also been issued to expedite the 148 pending cases, he added. During the discussion, Agriculture Minister Radhakrishna Vikhe Patil said that automatic weather stations will be installed in 2,900 revenue circles in the state within the next three months so that farmers may be provided up-to-date weather information through SMS. He said that the process has been delayed due to discrepancies in tenders earlier.